One of Sir Rocco Forte’s newest hotels is the Verdura Golf & Spa Resort, set on a gorgeous stretch of Sicilian beach. With rooms designed by Olga Polizzi, a spectacular spa, free kids club and world-class golf courses, you may be tempted to stay put. However, we recommend car hire to explore this fascinating island. 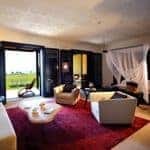 Verdura Golf & Spa Resort, one of the Rocco Forte collection, has rapidly established itself as Sicily’s most luxurious resort. Spread across 580 acres along 1.8kms of glorious coastline, Verdura offers exclusivity, privacy and elegance combined with informal relaxation. The Olga Polizzi interiors are a blend of modern and traditional, with warm, earthy tones designed to reflect the natural Sicilian landscape in an incredibly chic manner. The 203 guestrooms and suites are particularly spacious and all boast four poster beds with a sea view from the private balcony or terrace. Verdura is a golf-lover’s paradise. The resort offers two 18-hole championship golf courses, plus a 9-hole course and driving range, designed by renowned golf course architect Kyle Phillips. A team of PGA-qualified professionals is on hand to offer tuition to all ages and abilities. Other sporting facilities include a stunning two-tiered pool, six floodlit tennis courts, yoga classes, watersports and bike hire. Horse riding, scuba diving and fishing are available nearby. The complimentary Kid’s Club is open daily for 3 to 12 year-olds whilst teenagers have their own activity programmes. The vast Verdura Spa is one of the most sophisticated in Europe with its own swimming pool, outdoor Thalasso pools, a wide range of treatments and relaxation areas. 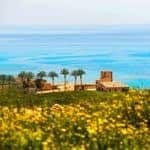 Sicily itself has so much to offer – we include a hire car so you can explore all the unique sights, from ancient Greek temples to baroque architecture. 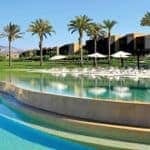 Click here for more about the Verdura Golf & Spa Resort and our full range of hotels in Sicily.